Ollie & Penny really are spoilt little sausage dogs. I’m sure they should be fat little barrels with stubby Tyrannosaurus Rex arms poking out at this stage, with the amount of treats they are eating lately. I’m sure they will never complain. 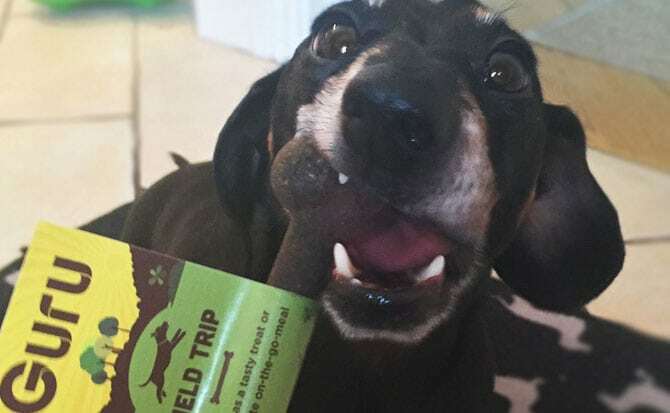 Maybe it just goes to show that the treats they are eating are quite good for them, healthy and full of natural ingredients – which they enjoy! No big bellies here – and that’s one of the reasons why we recommend the treats that we review & test. 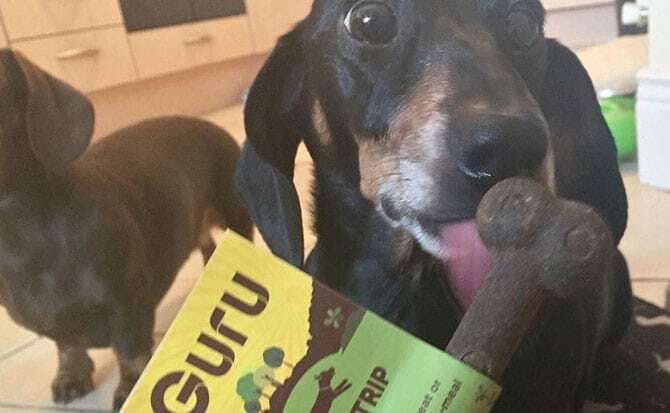 Well today is no exception to that, with the arrival of more yummy healthy treats and some new pet food for the wieners to try out from the lovely people over at Guru Pet Foods in the UK. 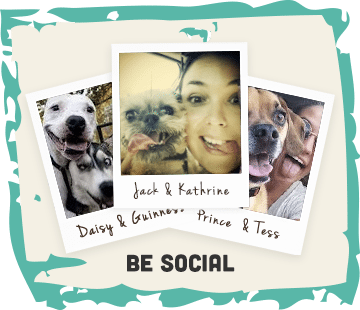 Guru Pet Food – Field Trip Bone Review from Ollie & Penny on Vimeo. 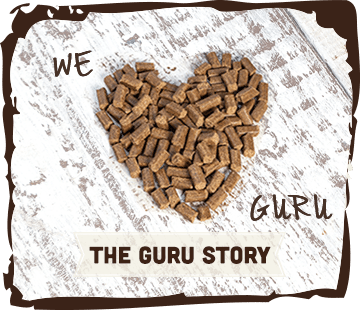 Guru Pet Food, as we mentioned are based in Devon in the UK and was founded by pet parents Lisa & Andrew. Back in 2013 they decided that they no longer wanted to feed their dogs dry extruded kibble but wanted to change to a more nutritious food to improve their pets overall health and behaviour. They found that preparing meals themselves was the best option but it was quite time consuming, I think we are all with them on that! So after a lot of research into different manufacturing techniques they discovered cold pressing – and to summarise, Guru Pet Food was born. A cold pressed dog food that retains as much of the ingredients nutrients as possible! 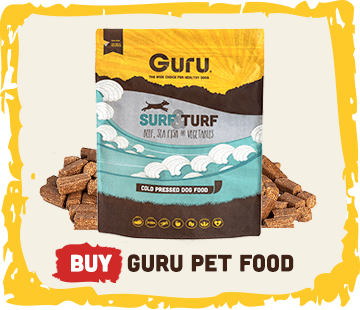 Guru dog food is as close to a dog’s natural diet as you can get! Back to the arrival. We have been spoilt recently with all the gorgeous handbaked treats that the sausages have been reviewing. We really appreciate the extra touches that some companies go to, such as the pawfectly wrapped goodies, the hand written notes, including gorgeous postcards and leaflets. We love all that. It’s so important to the get the style and presentation right when trying to sell a product. So the Field Trip bone was the first up for inspection. These are listed as being hypoallergenic, healthy and nutritious with no added chemicals, preservatives, gluten, colouring or additives. The main ingredient is chicken (28%) followed by brown rice (28%). From their actions Ollie & Penny could obviously smell these on the table – they do have that ‘kibblely’ dog food smell. We know that’s not really a word but I’m sure you all know what they now smell like. For us hoomans it’s not that nice but not off putting either. The Field Trip bones are the smaller of the sizes available, being 13cm x 4cm (thick end) x 1.5cm. Pawfect for smaller dogs like the sausages. The bones are quite hard so we broke them in half (quite easily) for Ollie & Penny to share. We wanted to see how they get on before giving them a whole one each. Both were straight in to grab their half and retreated to opposite corners of the house. I think its safe to say they really really like these bones. It didn’t take Ollie long to gobble up his. He can be quite quick to eat his treats, and sometimes we have to slow him down as he can get over excited and bit choked up if not supervised. Although half a bone was a bit of a mouthful for him it didn’t cause him any problems. He loved it. Penny on the other-hand is a completely different type of treat connoisseur. She likes to take her time and savour the flavour in her bed. Her approach was to slowly lick and break it up into smaller more manageable bits to eat. Although the bone appears quite hard she managed this easily herself. Sometimes we have to help her with other treat brands. Again – she loved this and was even licking the bed after it was obviously all gone! These bones we tested are the smaller size and weigh approximately 47g each. Although we gave them to Ollie & Penny here as a treat they are also recommended as a complete daily meal for dogs weighing 4kg – handy if you are away traveling and haven’t got time to prepare their usual dinner! They also come in large or ‘Road Trip’. The sausages also received a sample of Guru’s cold pressed food to try out: Surf & Turf! We love the name and the packaging – it really stands out! The ingredient list certainly lives up to the name. They include beef, brown rice, sea fish (…which is a bit ambiguous), sweet potato, vegetables, fruit and lots more! Do see their website for full details! =) Although Ollie has very specific dietary needs, this food looks like it would meet them all! Again it has no added chemicals, preservatives, gluten, colouring or additives. The kibble pieces are slightly larger and rectangular in shape than kibble we’re used to seeing, they can vary in size but are much more substantial in feel – you can see this from the photos. Breakfast time – our first trial with Surf & Turf. Dare I say it, the sausages knew something different was afoot. They usually get their breakfast kibble mixed with a little hot water to moisten it. This started after Penny was going through her second heat and went off her food. We found it helped her get her appetite back, so it stuck. Now it also doubles up for ease of adding Ollie’s epilepsy tablets. We didn’t change this. It was nice to see some advice on the back of the packet recommending the adding of water to Guru for those doggies (like our two) that may need it! We found that adding water made the kibble turn into more of a gravy while the kibble did keep its shape – it actually looked delicious!! Ollie & Penny certainly thought so – after gobbling their breakfast down they both continued to lick their bowls for a further 5 minutes – then swapped to lick each other’s bowls! =) I think that is two sausage paws up for Guru Pet Food! *Note: we usually wouldn’t recommend changing your dogs regular diet on a whim like this. It takes time, roughly over a 2 week period to slowly introduce a new food by mixing with a current food. Ollie & Penny had Guru’s food mixed in with their current food over two meals. Let’s get to the most important bit… Yes we are going to talk about poop. You can tell a lot about your dogs health and food intake by monitoring their poop. A good diet should produce a solid poop that’s normal in colour an easy to lift. So after feeding the sausages a new food we thought we may be in for a ‘change’ in their poop habits the next day. Although Ollie & Penny only sampled Guru’s food over two meals, there is no better way of judging it than looking at their poop! Straight out with it – their poop was slightly more solid! Yay! We’re putting it down to Guru’s food and possibly the treats. Guru initially passes the poop test – though we’d need to keep feeding Guru over a longer period for an accurate poop result! Each variety of treat bone and kibble has their own individual benefits and ingredient list which you should check out for yourself on purchase. Guru’s website is quite full of information on their products and has a great frequently asked questions section. We recommend reading up on this especially if you’re thinking of changing to their dog food! 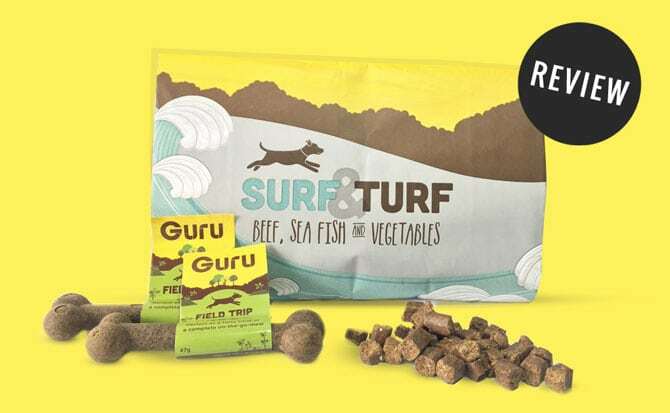 You can try these Guru Pet Food products out for yourself by going to their website: www.gurupetfood.com where they are priced from £1.99 for the Field Trip bones and from £24.00 per 5kg bag of Surf & Turf! As far as we can see they only ship currently to the UK – not to Ireland. Hopefully that will change in the future. Do let us know if your try them out! *Guru has provided the food & treats for Ollie & Penny to review. All views and opinions expressed are our own and we have received no financial contributions for this review.